Early on in the Ron Frick film Baraka there is a collage of moving images taken in Kathmandu as the sun is rising outside of a temple. There is a woman sweeping, the dust spreading out around her catching the first light of day. 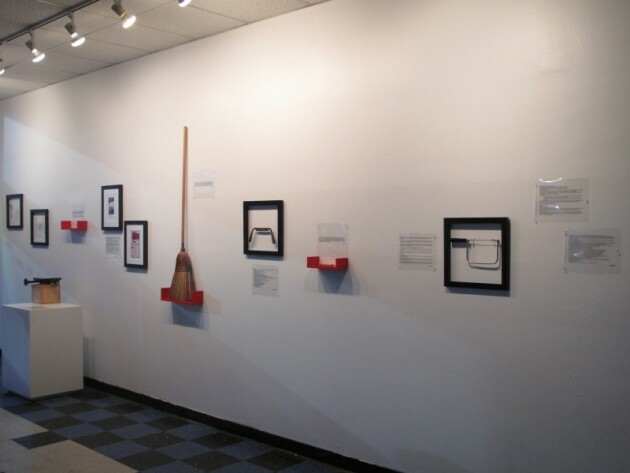 I was reminded of this image when I first saw Julie Crow’s broom that is on display tonight in the Tools Exhibit at Big Car Service Center. The show also includes tools used by two photographers, a carpenter, a teacher, a writer, a frame maker, two artists, and others. When Rebecca and I first discussed this show we originally thought of some vast display of objects filling up the warehouse-like space at Big Car. There was this sense that the “idea” of tools operates like some gigantic, invisible magnet drawing in metallic instruments from all directions. What we discovered was something very different. We reconfirmed real tools do exist. But more importantly these objects hold great power for their current owners. I write the words “current owners” because there is a strong sense, in all the tools in the show, that a hand-me-down process is central to the power contained in these things. Many of our Tools Artists speak about a parent or grandparent. Time, history, and the memory of specific actions anchored in a skill are all referenced in these entries. The submissions caused us to rethink and redraw the map in our heads for this show. The conceptual space occupied by this event is one of colliding stories and life lessons. When it comes to tools, it appears, there is no small talk. During the development of Tools Big Car announced its plans to leave the space at 38th and Lafayette Road. This place is hallowed ground for both Rebecca and I. She grew up down the street in Eagledale. And I remember sitting, near this spot, on the open tailgate of my parents’ station wagon, in the early 1960s, eating take out with my family and watching the movie across the street at the Lafayette Road Drive In. Her parents worked and raised a family. My parents worked and raised a family. Both of our lives growing up were littered with landscapes of interrelated tools – some different, some the same, many forgotten, until now. As we installed the exhibit for tonight’s opening the folks at Big Car have been packing up, organizing stuff, making piles, and getting ready for their move. Everywhere you look in Big Car you will find a tool of one type or another – here is a HB pencil Anne Laker let me borrow to mark out the center point along the gallery wall. (I left it in my ear and I need to return it to her.) Here the shovels, pitch forks, and rakes look as if they belong more to the earth than to any one individual. (The garden beds outside are all being hauled to other locations.) There is an old hand truck that appears and disappears like a phantom from another era. Many of these objects feel as if they belong to the writer, the poet, or the artist named “Anonymous”. Through our work for this show Rebecca and I discovered that tools operate on both the highly personal and the highly anonymous levels. They “belong” to us for a time and then they are hauled off to other scattered locations and “current owners”. It’s too bad that each tool doesn’t come with its own list of hyperlinks so that whenever we get lost in our own troubles we could just click on one of them to remind us of how the human world is made – one broom sweeping at a time.